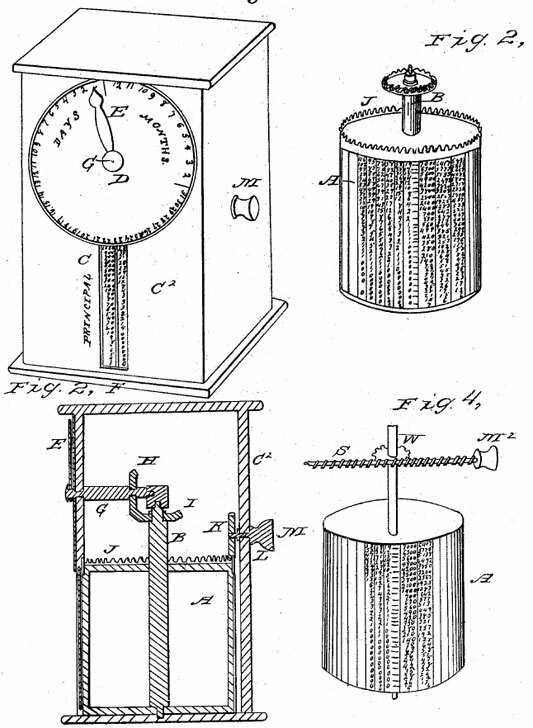 On May 6, 1844, a certain Jehu Hatfield of Glens Falls, NY, took out a US patent №3574 for a machine for computing interest, measuring lumber, and for other purposes. It is unknown how many devices were produced, but at least one managed to survive to our time (see the photo bellow). 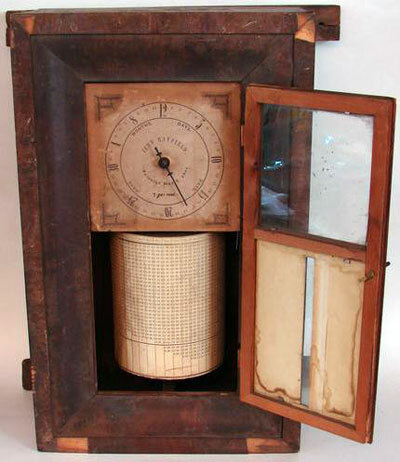 The device is housed in a Mahogany Veneer over Pine case, similar to the shelf clock cases made during the 1840s. There is blue colored paper on the inside of the lower half of the door. 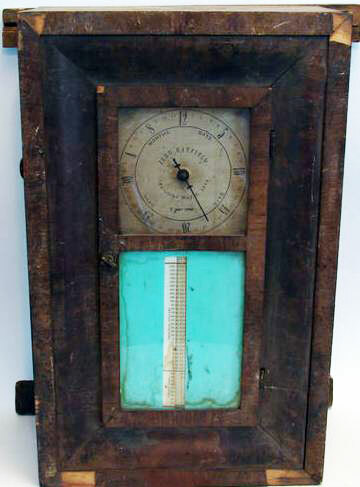 The calculating mechanism is operated by a turned wooden knob on the left side of the case. When the knob is turned the hand on the dial is directed to various "Months" and "Days". At the same time the hand in the upper section of the case moves the vertical cylinder in the lower half of the case spins to reveal the "Principal Dollars" and "Principal Cents" visible through the opening in the blue paper covered lower door panel. The machine (see the lower patent drawing) consists of a vertical revolving cylinder (marked with A), having on its outer surface vertical parallel columns of figures, representing the interest on the several sums shown in a stationary column on a surrounding case. There is also a circular scale, or dial (D), placed in front of the case in a vertical position, to indicate the days of the month, with an index hand, or pointer (G), which is operated by the cylinder—the two being connected together by mitre wheels (B). So, who was the inventor—Jehu Hatfield? Jehu Hatfield was born on 16 June, 1806, in Middle Paxton township, Dauphin County, Pennsylvania, as 6th child from the third marriage of John Hatfield, Jr. (1745-1813) and his third wife Nancy Berryhill (1766-1850). John Hatfield was a prosperous dairy farmer in Dauphin County. When in 1813 he died, he left a wife and thirteen surviving children (he had 5 children from first marriage, 2 from second and 8 from third, a remarkable productiveness:-), including Jehu. Jehu stayed in the farm for some years, before to relocate to New York State when he reached adulthood. Jehu Hatfield married too young to Harriet Hatfield and the couple had a daughter, but for some reason they obtained a divorce by act of Pennsylvania legislature in April, 1833. In the the same year Jehu married to Phebe Ann Wood (1804-1897) in Rensselaerville, New York. The new couple settled in Mechanicville, New York, where they produced three children: Mary E. (1835), Charles Berryhill (1838), and Ann Eliza (1842). In 1830s, working in spittoon and pottery making business in Mechanicville, Jehu Hatfield and his friend Joll Farnam, seeing some French fire-sticks offered for sale on the New York docks, decided to establish a massive match-making operation in USA. They claimed, that had invented the first friction matches, widely known as locofocos. Jehu managed to crack the chemical formula that ignited the devices and even was granted a patent in this area (US Patent №219, 1837). As fate would have it, a minor technical filing error exposed the incipient monopoly to the competition of those equally willing to reinvent French originals as the two Mechanicville industrial pioneers had been. So Hatfield quickly abandoned his original venture to seek greener pastures elsewhere. Jehu Hatfield died on 23 April 1871, in Troy, New York.